Opening day of dove season has a long tradition within Alabama’s hunting community, serving as the representative hunt to initiate the new year’s hunting season. While opening day hunts can be found in abundance on private lands, they typically require a significant fee to participate. Don’t let this monetary limitation catch you as a spectator this upcoming dove season, as the Alabama Division of Wildlife and Freshwater Fisheries (WFF) wildlife biologists manage several programs geared to provide quality public dove hunting opportunities, that appeal to even the most budget-minded hunter. In an effort to facilitate opportunities for young hunters and their mentors, our wildlife biologists coordinate the WFF Youth Dove Hunt Program every year, utilizing multiple WMAs fields and through coordinating with a collection of conservation-minded private landowners that donate the use of their fields for this occasion. During the fall of 2017, 32 youth dovefields were enrolled in this program, with over 700 youth hunters, age 15 years old or younger, and their supervising adult mentor, 21 years old or older or their parent, taking advantage of this free hunting excursion to kick off their season. To learn more about the WFF Youth Dove Hunting Program, visit the Hunting Section of the www.outdooralabama.com webpage. If you’re a private landowner interested in participating in this program, please contact your local district office’s supervising wildlife biologist or the administration Office in Montgomery at (334) 242-3469 for more information. In addition to the Youth Program events, several WMAs throughout the State manage fields specifically for providing public dove hunting opportunities throughout the season for anyone to enjoy. These opportunities are typically in the form of planted dove fields or agricultural fields with crops rows left intentionally to attract these fast flying migrators. Always be alert to any congregations of doves flushed when traveling through any early successional areas within the WMA, such as recently harvested stands of timber and clear-cuts, as they have the potential to produce hunting conditions parallel to that of the most manicured dove fields. Common native species occupying these areas such as pokeweed, croton, ragweed and a variety of grasses all represent excellent food sources that attract mourning doves like magnets when casting seed. Don’t restrict your hunting only to prepared dove fields to bag a limit, just keep it simple and hunt where they you find the birds. So if you’re searching for a dove hunt this coming Fall, don’t overlook one of Alabama’s WMAs to kick off your hunting season and then return throughout the season in pursuit of this iconic gamebird. Below is a list of WMAs any interested dove hunting enthusiast should consider this upcoming season. Hunt days and hours are also listed on the WMA Map Permit, which is required to be in possession of each hunter. Be sure to review those hunt dates and times as dove hunting, along with small game hunting, is not allowed during any youth, gun or primitive weapons deer hunt. Good luck this season! Swan Creek: Open to dove hunting from 12 noon until sunset on opening day then all day for the remainder of the state season. Contact wildlife biologist Drew Able at (256) 353-2634. Seven Mile Island: Open to dove hunting from 12 noon until sunset on opening day then all day for the remainder of the state season. Contact wildlife biologist Daniel Toole at (256) 353-2634. Freedom Hills: Open to dove hunting all day on Wednesdays and Saturdays, throughout the state season in designated fields. Contact wildlife biologist Daniel Toole at (256)-353-2634. Jackson County Waterfowl Area: Open to dove hunting all day on Friday–Sunday and 1/2 hour before sunrise to 12:00 noon, on Monday–Thursday, throughout the state season. Contact wildlife biologist Courtenay Conring at (256) 437-2788. Skyline: Open to dove hunting afternoons only, 12 noon until sunset, on Wednesdays and Saturdays throughout the state season. Contact wildlife biologist Frank Allen at (256) 587-3114. Hollins: Open to dove hunting all day on Mondays, Wednesdays and Saturdays, throughout the state season. Contact wildlife biologist Steven Mitchell (256) 435-5422. David K. Nelson (Demopolis): Open to dove hunting afternoons only, 12 noon until sunset, throughout the state season. Contact wildlife biologist Justin Gilchrist at (334) 289-8030. Mulberry Fork: Open to dove hunting afternoons only, 12 noon until sunset, throughout the state season. Contact wildlife biologist Chas Moore at (205) 339-5716. Oakmulgee: Open to dove hunting afternoons only, 12 noon until sunset, throughout the state season. Contact wildlife biologist Drew Tincher at (205) 339-5716. Lowndes: Open to dove hunting afternoons only, 12 noon until sunset, on Wednesdays and Saturdays, throughout the state season. Contact wildlife biologist Jeff Makemson at (334) 339-5716. Cahaba River: Open to dove hunting afternoons only, 12 noon until sunset, throughout the state season. 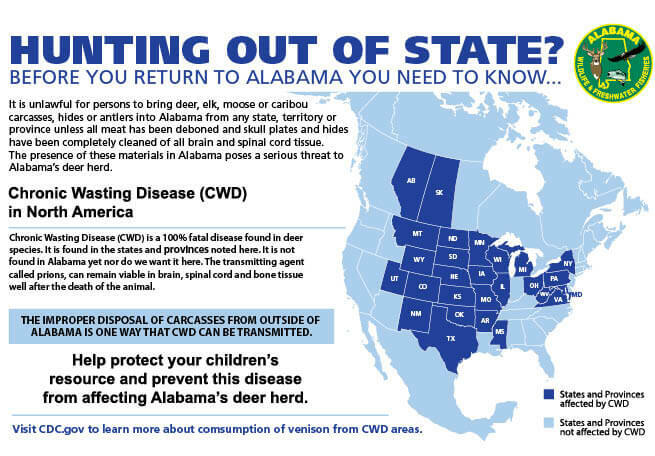 Contact wildlife biologist Chas Moore at (205) 339-5716. Autauga: Open to dove hunting afternoons only, 12 noon until sunset, on Wednesdays and Saturdays, throughout the state season. Contact wildlife biologist Jeff Makemson at (334) 339-5716. Barbour: Open to dove hunting all day on Wednesdays and Saturdays, throughout the state season. Contact wildlife biologist Adam Pritchett at (334) 529-3222. Perdido River: Open to dove hunting afternoons only, 12 noon until sunset, on Thursdays and Saturdays, throughout the state season. Contact wildlife biologist Chris Nix at (251) 626-5474. Lands or areas where seeds or grains have been scattered solely as the result of normal agricultural operations, which include normal agricultural harvestings, normal agricultural post-harvest manipulations, or normal agricultural practices. Lands planted by means of top-sowing or aerial seeding where seeds have been scattered solely as the result of a normal agricultural planting, a planting for agricultural soil erosion control, or a planting for post-mining land reclamation. Lands or areas where grain or feed has been distributed or scattered solely as the result of the manipulation of an agricultural crop or other feed on the land where grown. Lands planted as wildlife food plots, provided the seed is planted in a manner consistent with Cooperative State Research, Education, and Extension Service recommendations for the planting of wildlife food plots. In states without Cooperative Extension Service recommendations for the planting of food plots, the seed must be planted in accordance with Extension Service guidelines for producing a crop. Lands planted as pasture improvements or for the purpose of grazing livestock. (The Fish and Wildlife Service will not make a distinction between agricultural fields planted with the intent to gather a crop and those planted without such intent provided the planting is carried out in a manner consistent with the recommendations of State Extension Specialists). Standing or manipulated natural vegetation. A blind or other place of concealment camouflaged with natural vegetation. For further clarification, see www.fws.gov/le/huntfish/whatislegal.htm. The Alabama Cooperative Extension System recommends planting dates for some top sown grains between August 1 and November 30 depending on individual circumstances. For details see www.aces.edu/pubs/docs/A/ANR-1467/ANR-1467-low.pdf.